When you have an illness, you experience fatigue and pain. But we still must choose just what our life will magnify. Lisa shares. And Mary said: ‘My soul magnifies the Lord'” (Luke 1:46, ESV). About 15 months ago my husband was laid off of his job of nearly 20 years. I had just recently begun to homeschool our son and suddenly the daily routines of life were chaotic again. Now? One thing we know for certain is that we don’t know anything for certain. And our plans are now to “not make any plans.” It has been a year of incredible stress–and some joys as well. It has been a time for grief–and also unexpected celebrations and surprises of provision. When we began this journey it was important to me to not allow the struggle to define me. At times I wonder if I am in denial and should be more worried about the realities of financial woes, loss or change of health insurance, etc. Is it that I trust God or I am just too exhausted to think that much? With social media we can so easily post whatever feeling at the moment–forgetting that perhaps it doesn’t glorify or magnify the Lord. We can easily get caught up in the trend of being “authentic” and later see it was our sinful human nature that made us post something that didn’t magnify God in our life. So sometimes–when I am just too emotionally wiped out to filter my own attitude–I withdraw from it. We don’t need to hide our struggle, because therein lies our testimony of God working through the trial. If no one knows our realities, they do not see how God pieces together all the chaos and makes His masterpiece. And yet, as we list the justification we have to feel a certain way or snap at someone we love, God doesn’t give us extra credit for being “real.” He still wants us to reflect Him–or at least strive to. Rather than fulfilling our need for affirmation and understanding through Facebook friends, He wants us to come to Him first. Our life can quickly become defined by a collection of how we reacted to the tough days. We always magnify something. I struggle enough to not be known as “the mom who was always tired” or the “wife who gasped every time her knee slipped backwards.” I can’t control it all, but I can do my best to let my attitude reflect who my God is. Lisa Copen is the founder of Rest Ministries and the woman behind posting devotionals. She hasn’t been purposely being casual about them but rather In the last few months she has had foot surgery and fought off a post-surgery infection. She The website is having issues, she has major spam taking over her in-box and basically feels like she is in a bit of a Bermuda Triangle of tech issues. Between what she is juggling health-wise, as well as tech stuff, she regrets they have not consistently been 5 days a week. In the last year her illness has moved into a new level of disability, accompanied by fatigue and pain that is different than she has experienced before. She is also homeschooling and assisting her husband with their new jewelry business as much as she can. She thanks you for the mercy you give her and the prayers. 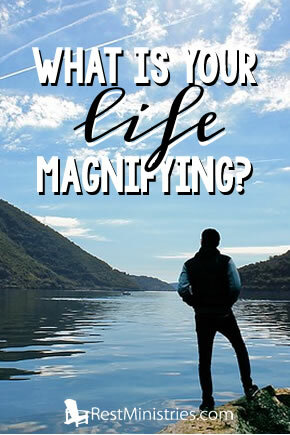 When you consider your life, what is it right now, in this season you are magnifying? It is something you have worked on, or something you need to work on? « Did You Know That What You Believe Matters?